Would you know what to do if you had a kitchen fire? Let’s be honest, we’re flooded with a barrage of messages online every day. 10 tips to success. 5 steps to being more organized. You have a problem, I can guarantee someone has written you a 3 step guide to overcoming it. While it would be easy to tune out and not finish reading this blog post, I urge you to press on. It truly is a matter of life or death. So what am I referring to? Household kitchen fires. Ok, hang in there. I know you’re thinking, “Kitchen fires happen to people who are careless, it wouldn’t happen to me.” But that is where many great mistakes begin, in believing it could never happen to you. Cooking fires far exceed most home-related fires and they are more expensive to repair. Do I have your attention yet? These statistics are too startling to ignore. Check out this video to see what can happen from a stovetop fire. In addition to being dangerous to your health and well-being, household kitchen fires are also extremely fiscally damaging. 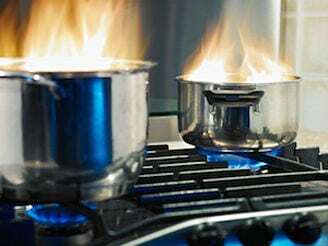 According to claims data compiled by Nationwide Insurance, the average cooking fire damage claim is more than $30,000; four times higher than the next most expensive type of homeowners claim. Pizzi found that March – followed by April, December, October and May — were the months with the most kitchen fire claims. So how do you make sure you don’t become a statistic? Here are some tips from the NFPA. Never leave the ktichen when you’re frying, grilling or broiling food. Taking these precautions and being aware and alert while cooking can go a long way. Remember, no one ever thinks it will happen to them.